Ruth's Story: She's a Fighter! Lately my heart has been heavy. Heavy with the misconceptions people believe about spina bifida. Misconceptions that lead some mothers, when faced with a choice, to end their baby's life before it even has a chance. I belong to a support group for parents of children with spina bifida, and I must say, it is the most positive, optimistic, supportive place I can imagine. I found the group shortly after Ruth was diagnosed at 20 weeks, and have looked to fellow parents for advice, support, or just a listening ear. Often women come to the group after finding out the same diagnosis. Every time, EVERY time, the parents of this group rally around to offer words of encouragement and support. Positive stories, because, spina bifida is not a death sentence. These kids live very full and long lives, and enrich the lives around them. While I would prefer Ruth not to have been born with spina bifida, it is was she was given, and we love everything about her. She deserves to live. She is a FIGHTER. A few weeks ago a woman came to our group, she had gotten news no expecting mother wants to receive. She was given an outpouring of support from myself and other parents. Questions answered, encouraging words. This journey is HARD, but it is so much more rewarding. She was open about being unsure about termination, she was given kind messages about why not to terminate, why all the women here did not terminate. But she is undecided whether her baby is worth giving life to. She told us she looked at our blogs, our children, and still was not sure her baby deserved life. Termination. An action I never considered, never could have considered. I am pro-life. Babies deserve a right to live. I have been in this woman's shoes. Faced with scary news about my unborn baby. But never once did I consider my baby didn't deserve a chance to live. Why not adoption? To this woman, that is the dirty word. She even went so far as to post an online poll so people could vote on the life of her child. HER child. I am saddened. Beyond sad. This baby deserves so much more than an online poll to determine it's chance at life. What can you do? At this point, please pray this woman finds it in her heart to love her child, to give her child a chance at life, even though that child may have needs that are inconvenient. And if that is not possible for this woman, pray she can find it in her heart to give the child up for adoption. Please PRAY. Not death. Not termination. LIFE. There is still hope. Her baby still lives. UPDATE 10/28 I was recently told this woman chose to keep her child! How awesome is the power of prayer! I love your post, and that photo of Ruth really sums it up. A picture does say a thousand words. I am praying, praying for many things associated with this fiasco, but especially for this little baby to see the world. You are so right, "This baby deserves so much more than an online poll to determine it’s chance at life." Ruth is quite a little peanut. 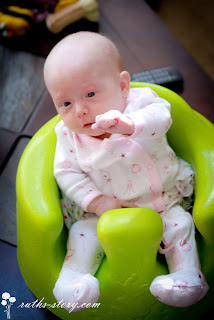 I love how she's giving a little "right on, Mommy" fist-pump-to-the-air. Her child is WANTED, someone somewhere WANTS this child. So many of us would very willingly and eagerly adopt this precious child. I pray this mother will get the help she needs (because I feel she's really struggling with possible depression) and make a clear and wise choice about what's best for this child. If she can't find it within her circumstances and heart to keep her child, I pray she reconsiders adoption. God led me here today. I have prayed for her and her choice. God bless you & those in your group. I have a dear friend whose daughter has SB, she is now 13 and such a delightful young lady. Yes, she has a few difficulties, but we all do. She loves to read & sing and everyone in our church loves her as much as she loves them. Life would not be the same without her. Keep telling Ruth's story, you are saving lives.